Our Universal Nut has been re-engineered with a recessed back. Now you can securely tighten ALL King Arthur's Tools accessories to your angle grinder with this truly "Universal Fit" nut. UNIVERSAL NUT recessed back allows disc to be tightened on different size angle grinders. Choose either a 5/8" or 14mm center Universal Nut. NOTE: Only blades with 5/8" (16mm) and 14mm center hole sizes may be tandem mounted. Using the Universal Nut with its 21mm hex head replaces the different manufacturers’ size 2 pin spanner nuts for a simple and secure fit, using our made-to-fit Universal Wrench, or your wrench or pliers. Problem: Power tools from different manufacturers all have proprietary different sized nuts and two pin spanner wrenches, none of which are compatible with each other. 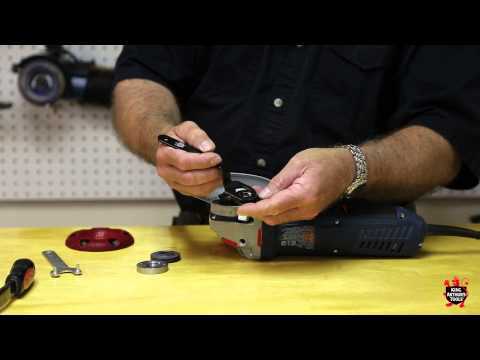 Solution: This frustrating issue is now resolved with the Universal Wrench, Flange and Nut Set, however, if you only want to replace your angle grinder’s manufacturer’s nut, then use the KAT Universal Nut. Best used with our 21mm hex head wrench. Now use the KATools Universal Nut and Flange to secure all disc accessories to any manufacturer’s power tools that has either a 5/8” or 14mm spindle thread shaft. This includes electric and pneumatic angle grinders, sander/polishers and sander/grinders ranging from 4-1/2” to 9” (115mm to 230mm). Secure & Tighten any Accessory: Using our Universal Nut and Wrench, easily attach flap disc sanders, grinding wheels, chainsaw blades (single or in tandem) carbide discs, wire brushes, masonry blades, polishing and buffing wheels as per manufacturers’ instructions. The Universal Nut fits all 5/8” or 14mm spindle thread shafts, including Ryobi, DeWalt, Porter Cable, Milwaukee, Black & Decker, Hitachi, Makita, Bosch, Fein and other makes of electric and pneumatic power tools, from angle grinders, sander polishers and sander/grinders.